“Namesakes” Valkyrie bomber of the sixties with artist's rendering of a future sportscar. Above, I have included the first of a small number of design proposals created using the independent's method of placing the new exotic body on an existing chassis. 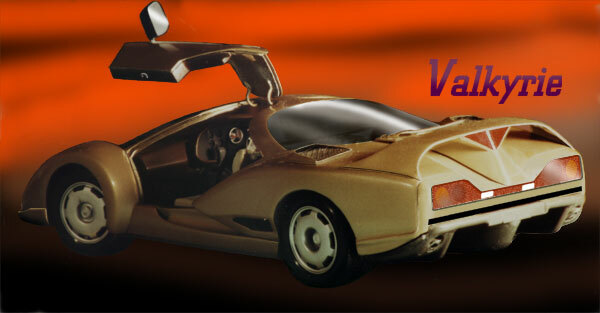 The one shown above is called the Valkyrie and was constructed around a Jaguar XJ 220 chassis in 1/18th scale. It is intended as a one of a kind show car. From time to time, I will be including other images of my own designs and any comment or suggestions for the Design section of this site is welcomed. Just send it to the below e-mail -attention Design Section.